Musical Notes Gift Bags – Add an extra special touch to a gift by using one of these cool music note gift bags! 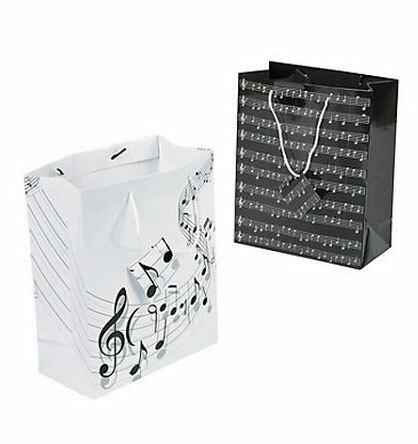 One bag features a classic sheet music rendition in a white font on a black background, while the white bag consists of a more stylized version with a single ledger line cascading across the entirety of the gift bag. Hanging tags attached. A great way to dress up any gift. Size: 7.5″ x 3.5″ x 9″. Comes in a set of 2.